We like playing Pre-recession, Post-recession in this household. It’s all subjective, of course, but it’s fun once you get into it. For example, Pre-recession destinations include Ibiza and Iceland. Post-recession places include Norfolk and Paris (so un-trendy for so long, but now oddly desirable again). Jordan is Pre-recession. Fiona Bruce is Post. TV shows in the Pre-recession category include everything associated with Gordon Ramsay, Grand Designs and Top Gear. Jules Holland is Post-recession. As is Glee. 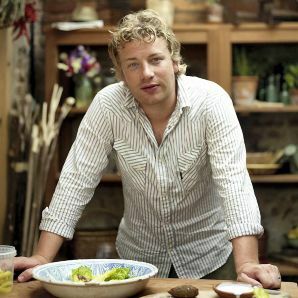 And I think, on balance, Jamie Oliver comes out as Post-recession too. And this is from a girl who rails against the cult of the celebrity chef. Yep. Hands up. I’ve done a U-turn about Jamie. And I don’t think I’m the only one. When he first came out and did that whole moped malarkey and became Sainsbury’s whipping boy, everyone got sick to the back teeth of him. He was called a ‘fat-tongued ****’ if you remember. A lot. I never really believed he had all those ‘mates’ in his trendy loft apartment. I always thought they called him the fat-tongued thing behind his back. Nobody liked him. In fact, I can recall a drunken night back in the last century when we burnt Mr O’s first cookery book in the garden. Sacrilege for writers to burn books, I know and very mature, however our vitriol knew no bounds. But credit where credit is due. Jamie does so many thinks right. Not least of all, his latest cookery show, where he’s been doing a whistle-stop tour around Europe and bringing us the best recipes. And contrived though it all must be, many of the situations he gets into seem very real. Most admirable of all, however, to my mind, is that he actually eats what he’s made on the show. He’s not waiting for the lowly public to taste his creations, he actually shoves the just-cooked food in his own gob. Inspirational. We live around the corner from Jamie’s Recipease shop. It’s pink. Being a Dad of girls, I suspect one of his kids chose the colour. But as a shrine to all things Jamie, it works. The staff there are uber-friendly, the food is delicious. It’s also very handy for birthday and Christmas pressies. They used to have pizza stations where you could take the kids to make a pizza and they’d wrap it up for you and you could cook it at home, but mercifully, the kids have been banished, such is the demand for cookery lessons. Jamie, it seems, is not only good at putting his ideas into practice, he’s happy to adapt them too. Perhaps Jamie should do courses in how to be successful, as well as how to cook the perfect risotto. Dave and Nick could pop along after work with the new cabinet. After all, Jamie survived the last government and came out on top with shed loads of wonga. Wouldn’t it be nice if the new government could say the same thing too?